Buffering the risk of living to a very old age. The longer you delay taking payments and the more advanced age you start taking them, the greater the monthly payout. More people are living into their late 80s, 90s and even past 100. But longevity isn’t so great if you run out of money. To avoid that risk, you can buy longevity insurance. It’s a special kind of deferred annuity that assures you’ll have a guaranteed income forever, even if you live to 100 or beyond. The longevity annuity hedges against the financial risk of living a very long life. You can think of it as the opposite of life insurance. The longevity annuity — also called a deferred income annuity — combines tax-deferral with a future stream of income. Instead of paying anything immediately, it defers payments until a future date of your choice. Most buyers choose to start taking payments when they turn 80 or older. You’ll know the exact amount of monthly lifetime income you’ll receive and the exact date when it begins. You can buy either a single-life annuity or a joint-life annuity, which typically covers both spouses. It’s the most efficient way to protect against outliving your assets in very old age. The power of the approach results from two things. First, the insurer invests your money for many years, enabling it to compound until you begin receiving income. Second, buyers who do not live to an advanced old age in effect subsidize those who do. The longevity annuity offers a different way to plan for retirement. Suppose you’ll retire at 65. You can use part of your money to buy a longevity annuity that will provide substantial lifetime income starting at 85, for example. Then, with the balance of your retirement money, you only need to create an income plan that gets you from 65 to 85 instead of indefinitely. You don’t have to deal with the uncertainty of trying to make your money last for your entire lifetime. Also, since you know you’ll have assured lifetime income later on, you can feel less constrained about spending money in the early years of your retirement. You can buy a longevity annuity with taxable savings or within an IRA. The latter is called a qualified longevity annuity contract (QLAC), which is a type of longevity annuity designed to meet specific IRS requirements. There’s a $130,000 lifetime limit on deposits. 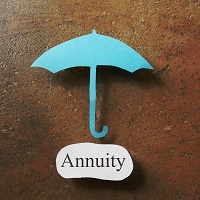 The annuity can be purchased with a lump sum or a series of deposits. The issuing insurance company guarantees a lifetime income to begin at whatever age you choose, starting no later than 85. If you’re married, you and your spouse can each buy individual longevity annuities, or you can purchase a joint payout version, where payments are guaranteed as long as either spouse is living. What happens if you die before you start receiving payments or only after a few years, when the total amount of payments received is less than the original deposit? To deal with that risk, most insurers offer a return-of-premium option that guarantees your beneficiaries will receive the original deposit premium. This is a popular option, but it does reduce the payout amount slightly when compared to the payout amount without the return-of-premium guarantee. It comes down to personal preference. If you don’t have a spouse or anyone else you want to leave money to, you won’t need this option. More information about longevity annuities, including a video, is available at www.annuityadvantage.com/annuity-type/deferred-income-longevity-annuities. Click here to sign up for more Dentist's Money Digest content and updates.